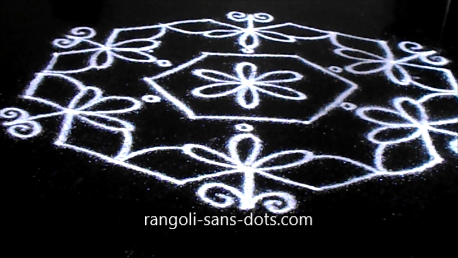 The first rangoli is a flower rangoli or flower kolam using a 9 to 5 dot pattern ( idukku pulli also called idai pulli or sandhu pulli ). 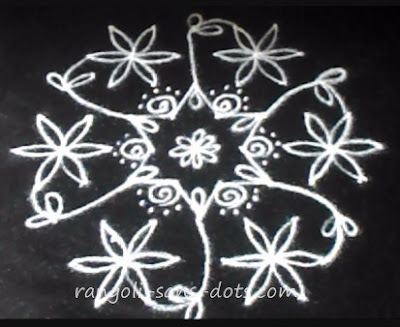 After placing the dot grid draw the floral design at the centre by drawing the stamen with six petals around ( the lobes are separate in this flower ! ). Next draw the remaining six flowers around the centre. 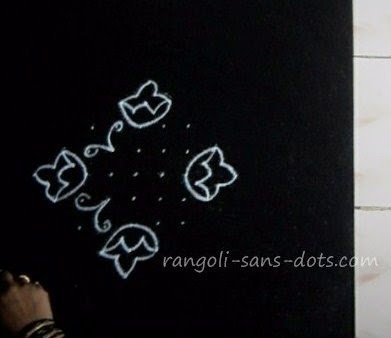 The remaining dots are used to draw tendrils ( after all we have to draw something related to flowers - so tendrils that can be related to flowers some way ). Connect the tendrils to the six petals as shown. Colours can be added according to our imagination. 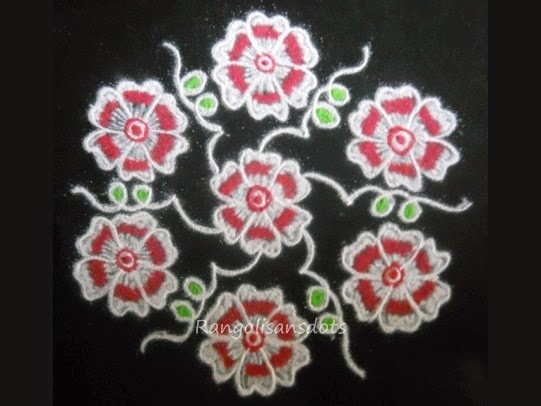 I have tried white, red and white by adding small lines drawn closely radiating from the centre. We can also fill the petals with a single colour or we can use different colours - one of the central flower and another for the remaining flower. The choices can be limited only by our imagination. Each will be beautiful or awesome in its own way. 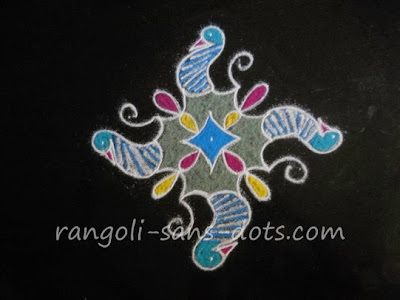 This rangoli is apt for those who want a simple rangoli for themes like flower rangoli for competitions or for festivals like Diwali or Pongal. 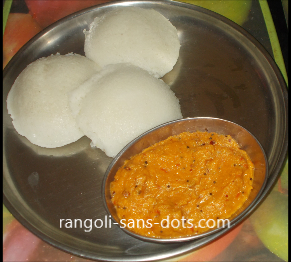 I think these kolangal can also fit in where the space is short . The next kolam in this category is a beautiful peacock like bird kolam design. 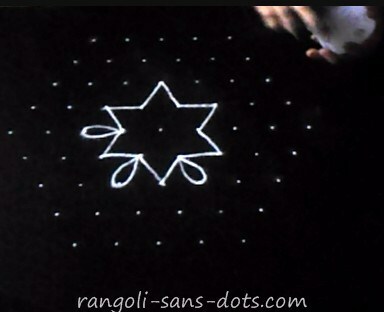 The dot pattern used in 9 to 1 ner pulli ( straight dots ). 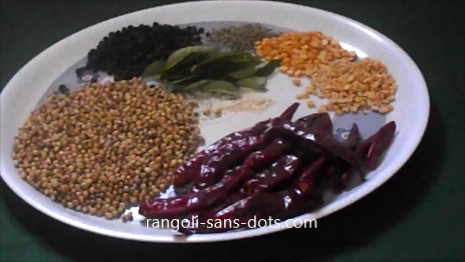 The final image with colours is shown in the photo below. The three images in black and white show the steps. Draw the spirals at the centre and then draw the curved lines on all four sides. Complete the wings as shown in the second image. The third image shows the head and neck of the birds being drawn. The result four birds ( resembling peacocks ) on four sides. 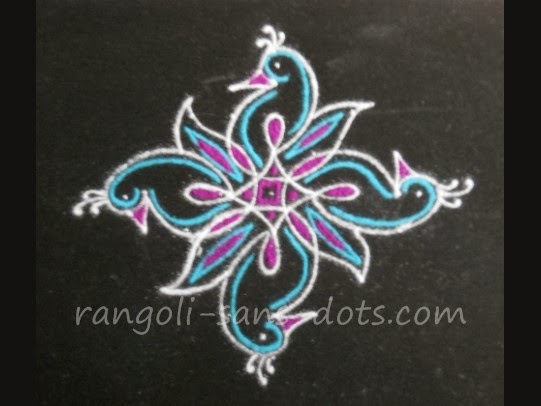 A simple way of representing beautiful birds through a kolam or rangoli. 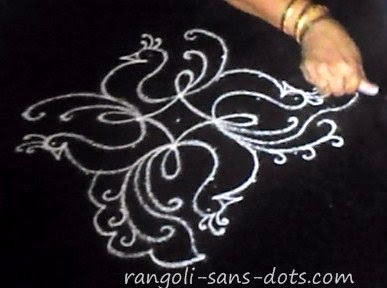 We proceed further to add more decorations to resemble feathers of the tail to get the kolam design shown in the final step. If we have time to spare we can add appropriate colours too. 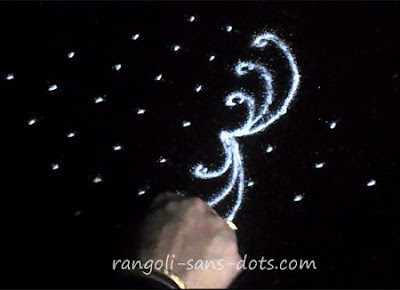 The wings idea used for the peacock rangoli drawn above, can also be used for making butterfly kolam with the same dots pattern 9 to 1. The three images show how this can be achieved. The four butterflies appear to fly in four directions at four different points. 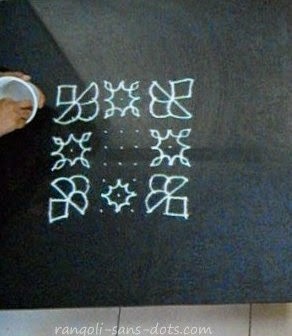 The first image shows how the wings are drawn. After that it is a matter of adding the head and thorax and antennae of the butterflies. 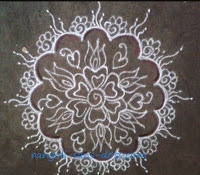 I have left the kolam plain and white for a change. We can add colours - what are butterflies without colours. 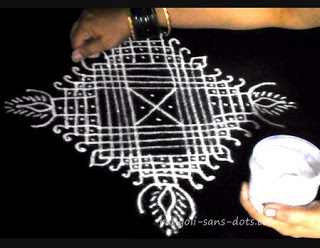 Using the same patterns that have been used in the previous kolam I have tried a 2 birds kolam with a 9 to 3 dot pattern ( ner pulli ). The birds appear as if they fly in opposite directions. Two intermediate steps before the final picture. 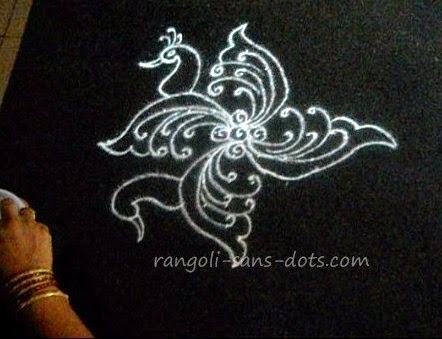 Some of the best kolam designs can be drawn with this pattern using dots or as free hand kolam. This has been one of my favourite motifs. 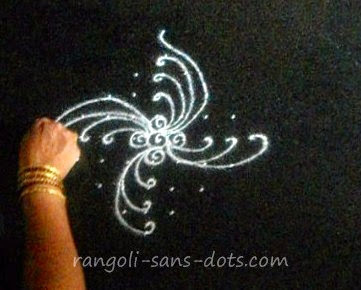 I have used them quite a lot in Rangoli-sans-dots. In fact I use this motif in free hand kolangal. One such kolam design that I drew for Varamahalakshmi Pooja is in the image below. If you are wondering why my hand is showing up in this kolam (! 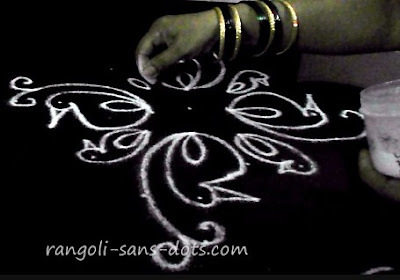 ), I invariably do this after drawing a kolam. It is my way of showing my love or affection for kolam or rangoli. Obviously I cannot touch it because it will get erased !. 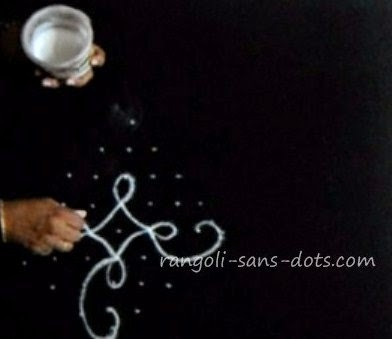 Any art needs involvement and this is the effect of me getting very much involved while drawing kolam. 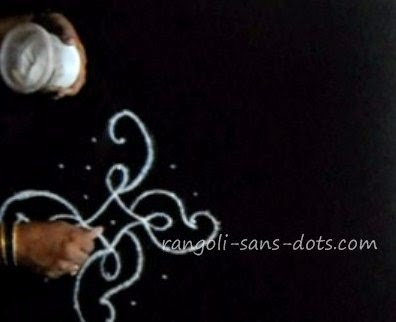 As my mother used to say ''manolayam'' - concentration on the task in hand and thinking of nothing else. Easier said than done. 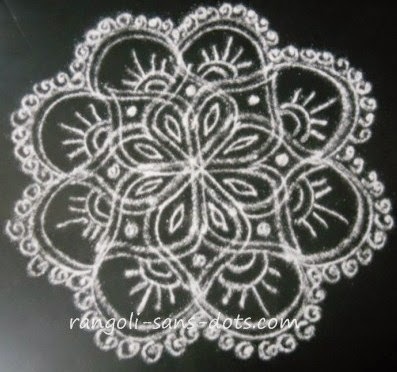 In fact I find it difficult to stop a kolam at any stage ( all practitioners of kolam I think will agree ) but time and space are huge constraints. 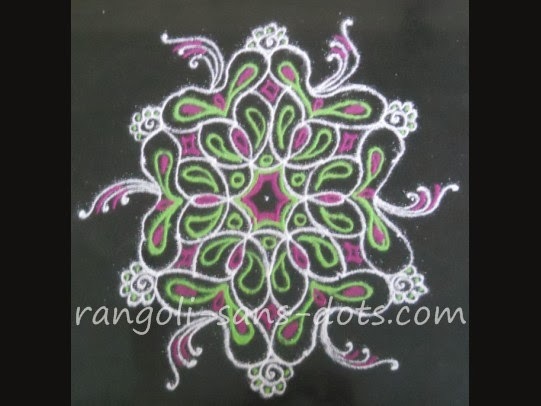 This is a kolam or rangoli design (kolangal is the plural of kolam for those who are not aware ). 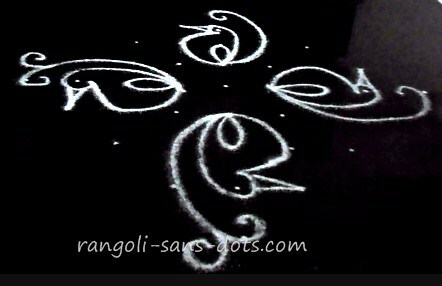 It is birds kolam design. I have added very few colours infact some colourful lines inside the birds patterns to make it simple. 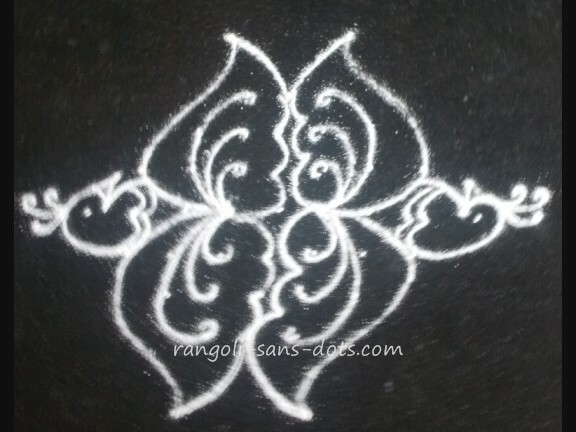 The intermediate steps for this kolam design are shown below. The dot pattern is 9 to 1. 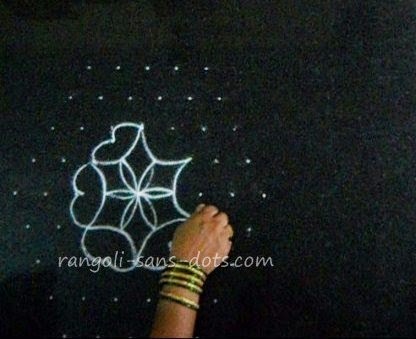 After placing the dots, draw the petal like patterns at the centre and connect the dots as shown. 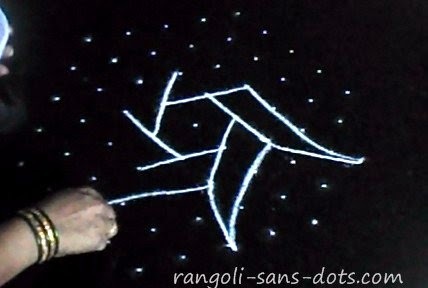 In the second stage use the dots above to form a bird pattern using dots and some free hand designs. This kolam and the one below are quite simple can be drawn as simple Margazhi kolam with 9 dots. 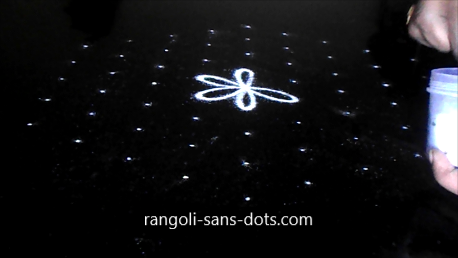 The rangoli above is of 9 dots to 9 dots pattern. 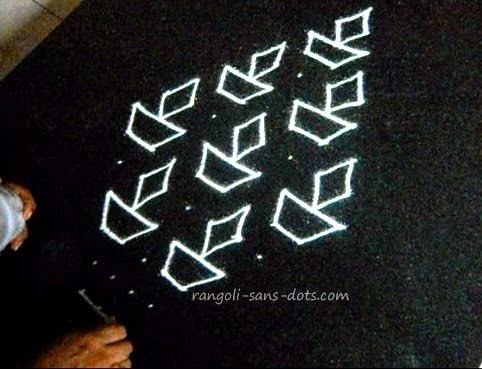 Draw the four lamp like designs on the four corners. 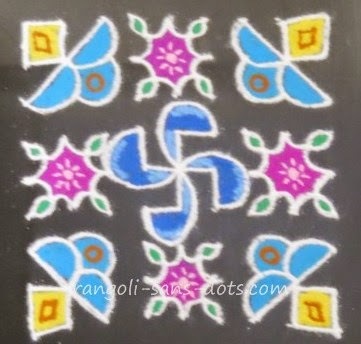 Add the central swastik design enhanced with simple lines as shown. 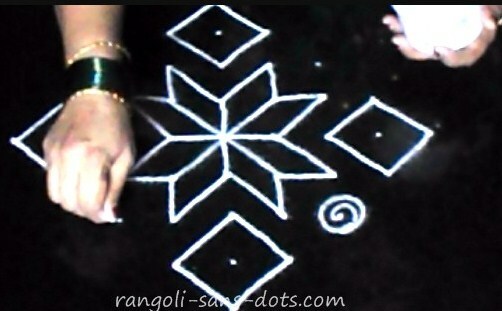 In the remaining dots add a simple sikku kolam design filled with colours and simple designs in white powder. 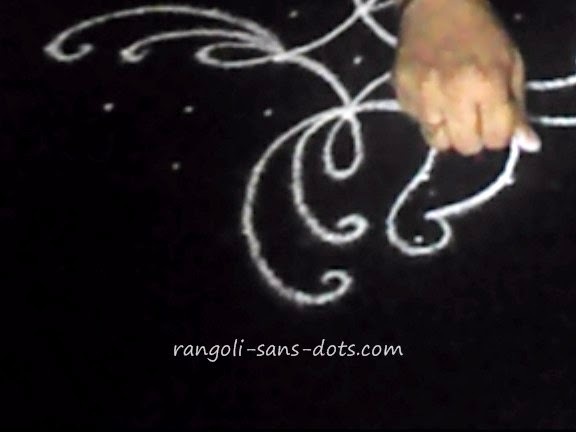 Two images showing how the kolam develops are also shown. 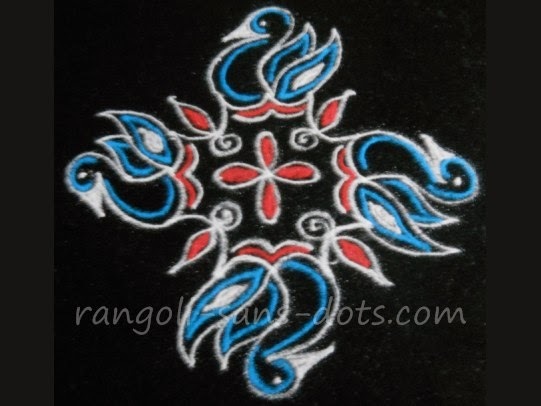 Sticking to the theme of birds in these kolam designs, there is common kolam design with peacocks representing peacock exhibiting its plumage. 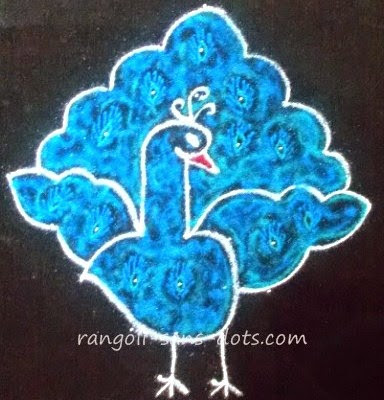 I have drawn a single peacock with 9 to 1 dots ner pulli pattern. 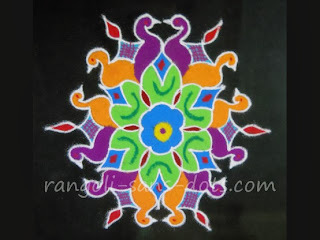 We can have two peacocks one at the top and one at the bottom or 4 peacocks on the four sides and that may necessitate a 19 dot grid - not used for daily kolam - may me used during Margazhi or for competitions. We cab stop at this stage so that the plumage is visible in the white pattern or we can add more colours suitable for a peacock and get the final image. 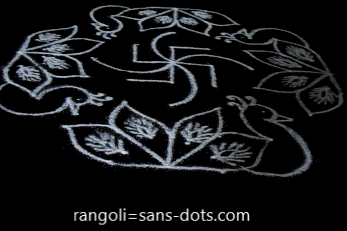 The next one in this series is not exactly a neli kolam. 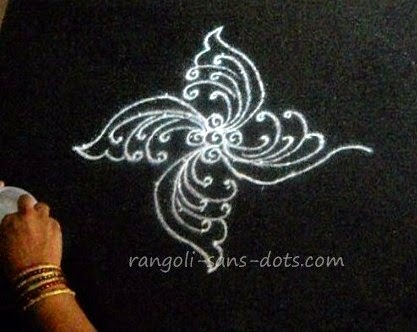 What I have tried is using a 9 to 5 dot grid using simple repetitive neli kolam patterns attempted to draw a different kolam. The dots remaining on the periphery are used drawing an outline. 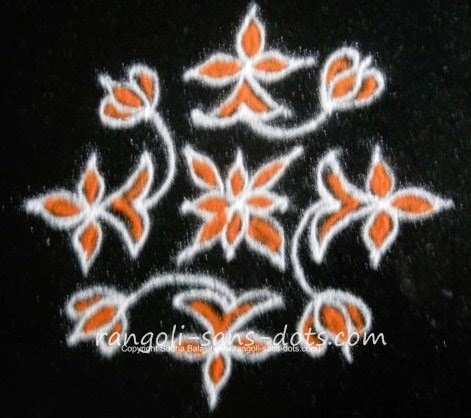 The dots remaining inside are used to decorate it with small and cute floral patterns. 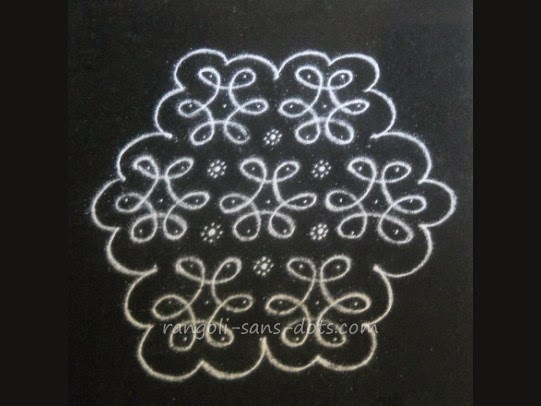 A different yet simple kolam that can be drawn as a kolam for daily use. 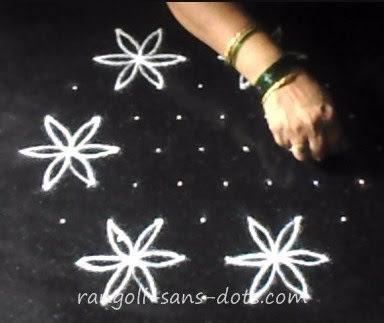 The kolam below and the stages showing connect the outer dots and using the dots in the middle. As they say regimentation and creativity do not go hand in hand. 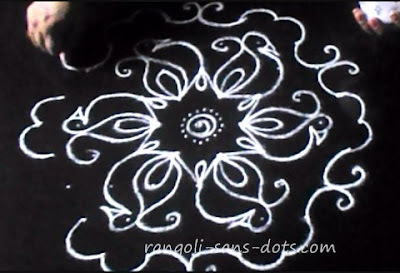 So we must allow our imagination to do its job and the probability of getting an acceptable kolam design is quite high! This can also be drawn for a daily kolam or vasal kolam design or if you are trying for a simple kolam for Margazhi. 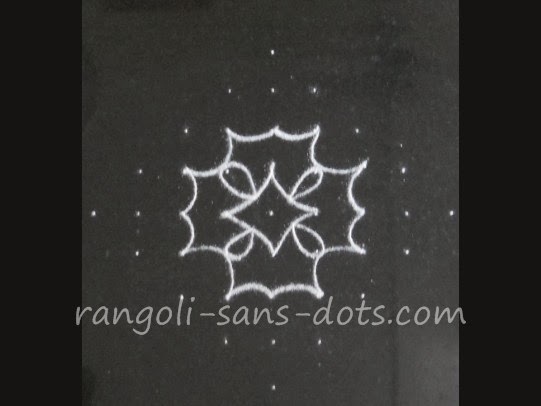 Though we use a nine dot grid it is a 9 dots simple rangoli design. 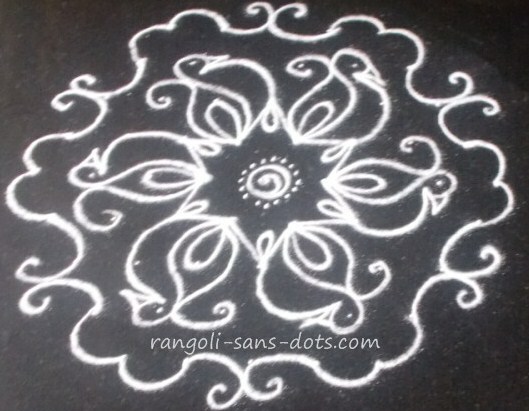 The kolam in the images with a dot template of 9 to 1. 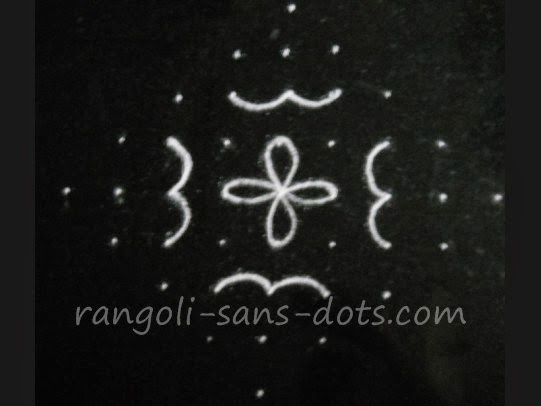 As usual place the dot grid, Draw the outer swastik-like curved designs on the four corners. 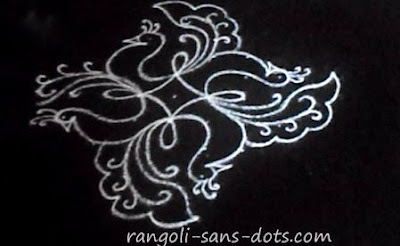 Then add the floral designs in the next stage. Now a few dots are left at the centre. Draw the design shown above. I have added two colours pink and blue to the plain design. A very easy and simple 9 dot kolam design. The two images showing the steps should of help if you have doubts in the steps involved in drawing the design in the image above. 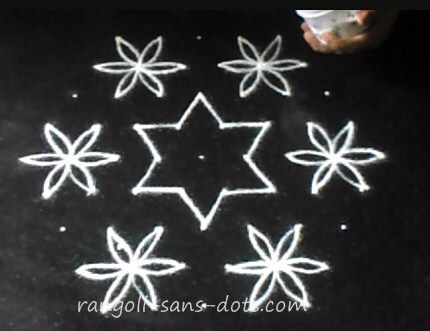 The kolam on the left is of dot pattern 9 to 1 (straight dots or ner pulli). 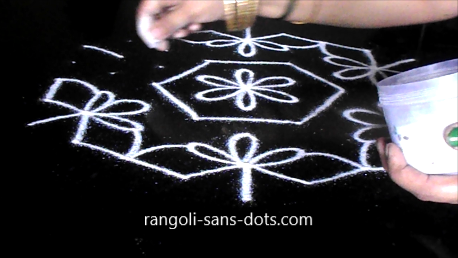 The dot template is placed with white kolam powder. The four outer flower-like designs are drawn. Then the patterns between them are drawn . The central floral design is drawn finally. Then the outer designs are connected to the central floral petals. Colours are used to get the image above. The two photos in black and white show two of the intermediate stages. 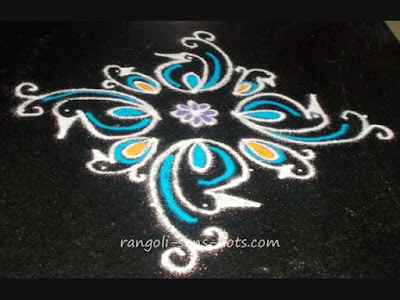 Tamil Puthandu kolam and Vishu kolam are important and both festivals occur almost at the same time. 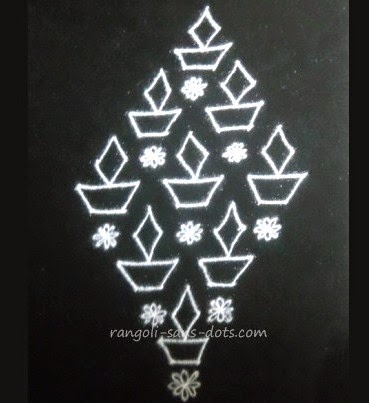 Maavilai or mangao leaf designs are considered auspicious ( we have mango leaf toran for important festivals ). So I thought I will share a mango leaf dotted kolam for these important festivals. 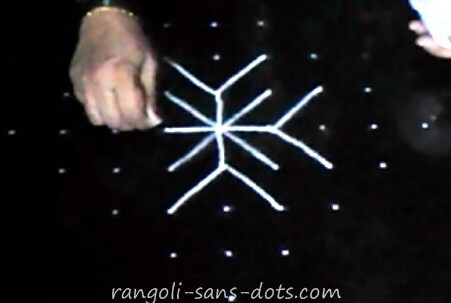 The dot pattern is 9 to 5 idukku or sandhu pulli. 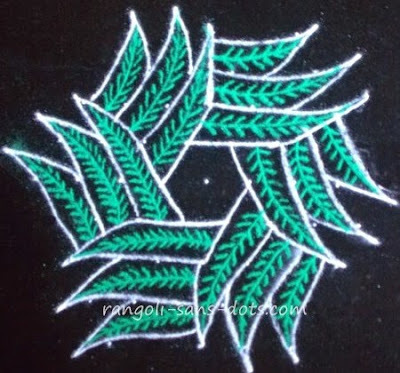 There are three layers of mango leaves ( in 7 dots there are two layers and in 5 dots there is one layer ). 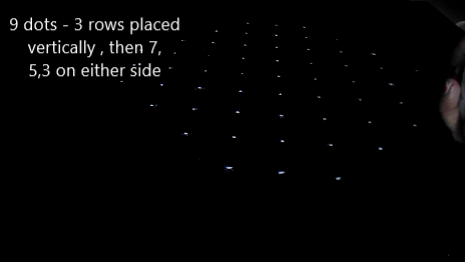 So this pattern can be continued for higher dot grids too. The design is quite simple. Finally add the veins of the leaves with green colour to get the effect of leaf designs. 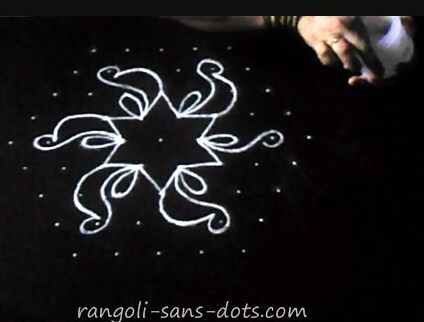 This could be an ideal Navaratri kolam with dots too. 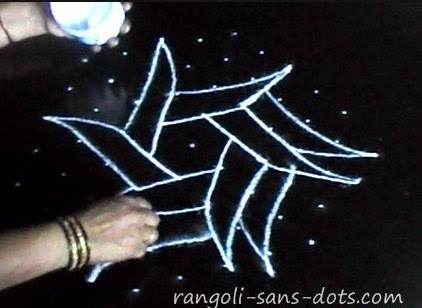 The black and white show the first layer and second layer of mango leaf patterns being drawn using the dot grid. 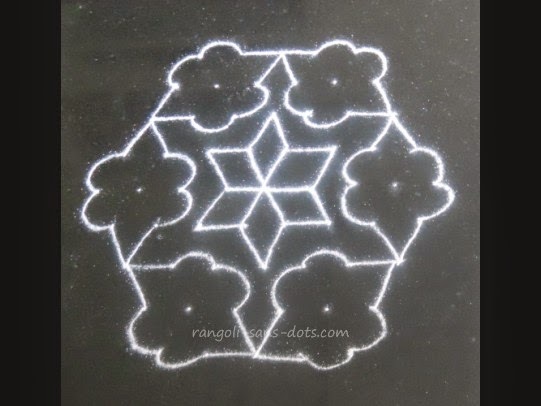 The third image represents the kolam / rangoli after completion. 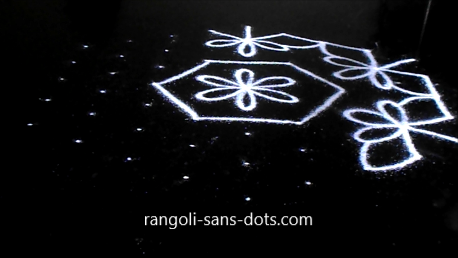 In a series of kolangal I published simple kolam with dots, pulli kolam designs, rangoli with 6 dots. 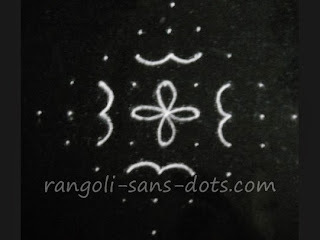 Hence this post I would like to devote to 9 dots kolams aka kolangal. 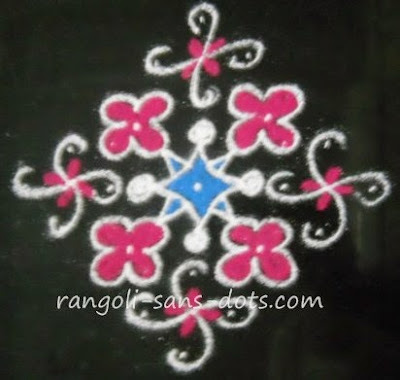 The dot pattern is 9 dots to 1 ner pulli - a simple design with petals. Place the dots , start the outer design of petals completing all the four corners. 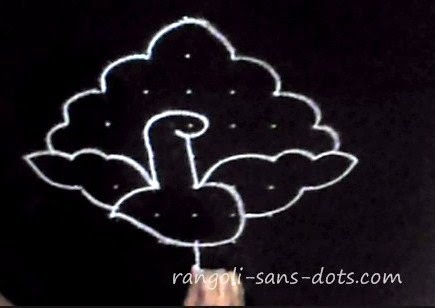 Then the central flower is to be drawn. 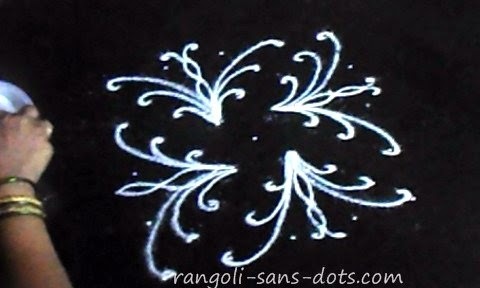 The remaining dots are also used to get some floral designs. 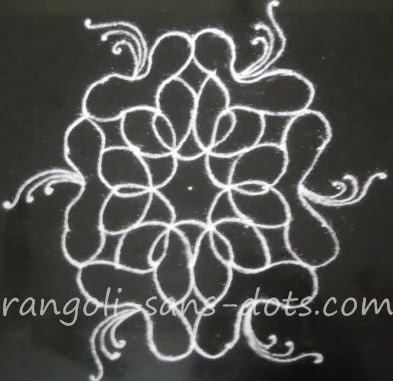 A simple kolam that can be completed quickly. 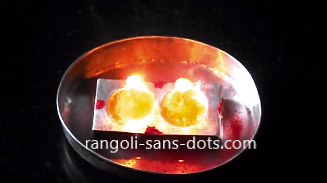 Apart from these there are few more 9 dots kolangal in my YouTube channel. 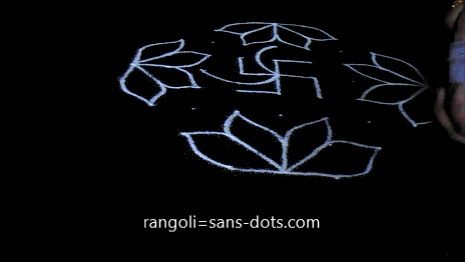 and Rangolisansdots in Rangoli with dots and kolam designs. Since they belong to this category they are share here too. They may also be available in a different category here. 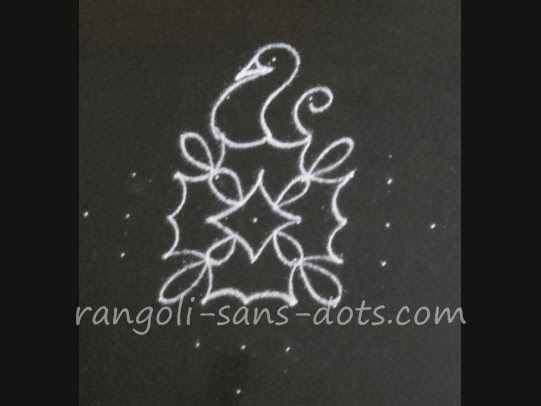 View the rangoli it the post, place the dot pattern and use it up with patterns at the centre and complete the design with simple and cute free hand patterns representing the head, neck and wings of birds. 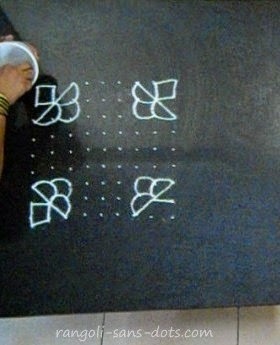 The image on the left is drawn with a 9 to 5 dot dots in between pattern. 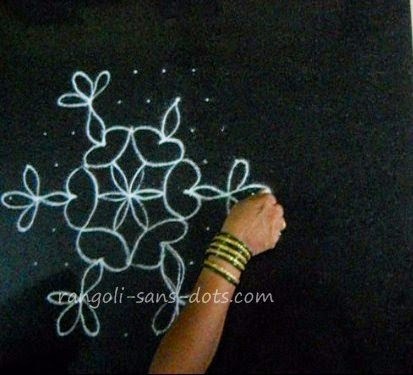 The dot grid is used to draw the designs first at the centre and from there the kolam is expanded. Finally some free hand designs are added at the centre. 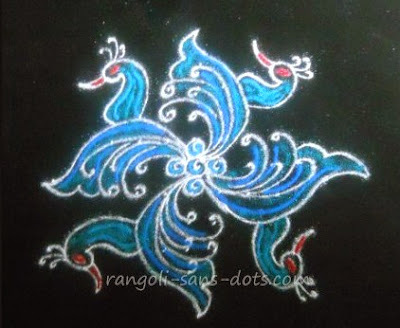 So while the basic birds designs are drawn using the dots along with few designs at the centre invariably the tail is drawn free hand otherwise the size of the dot pattern will increase and so will the intricacy involved. The next kolam in this post on colourful birds in kolam is shown in the three images below. The dot pattern used in 9 to 1 as is evident from the first image. 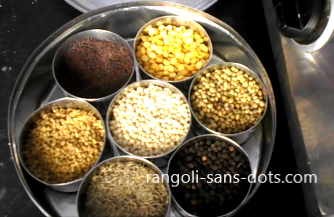 The dots in the third row (from the top ) the third row from the bottom and the third column on either sides are joined with curved lines the central dots remaining are used to get the central pattern. 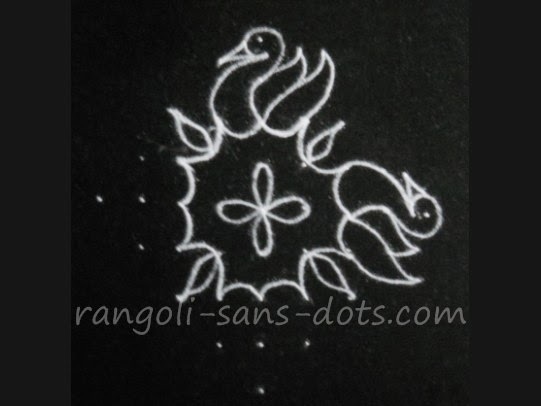 Then the four dots on the top ( 3 and 1 ) are used to get the bird design with one at the top serving as the eye and the tail is drawn around one dot. This bird design is an inspiration ( or is it imitation ! ) of birds like the pelican than are usually found in this pose. 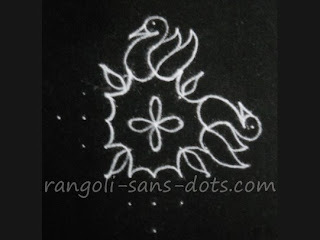 Similarly the remaining three bird designs ( at the bottom and the sides ) are drawn to complete the plain and white rangoli design. Add colours and fill the gaps with rangoli powder to get the final colourful bird kolam We can add crown on the head ( free hand ) to improve the design. One of the most common kolam designs that is drawn at the entrance of a house or apartment is the paavakkai kolam ( or bitter gourd kolam ) since it is supposed to resemble a bitter gourd. 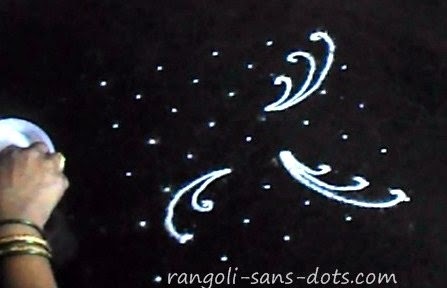 The dot pattern used in 9 to 5 (idukku pulli or interlaced dots ). 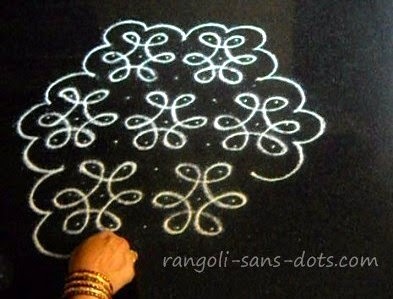 It can also be drawn with 9 to 1 pattern to add more bitter gourd designs at the top and bottom. We have to add dots on the sides to get the designs on the sides too. 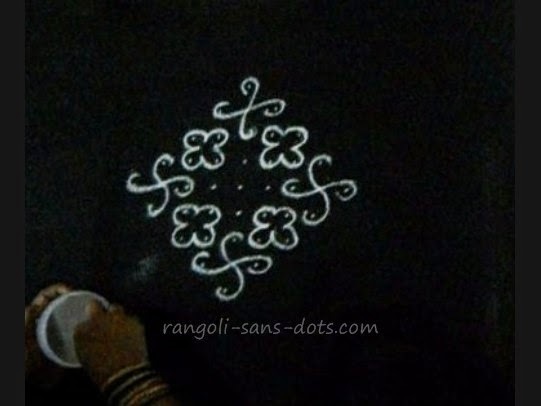 The two images below show the steps to draw this simple kolam. 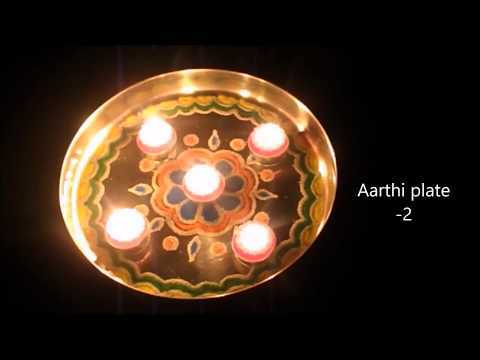 Deepam or vilakku as they are called in Tamil - are one of the themes for festivals like Deepavali and Karthigai Deepam. 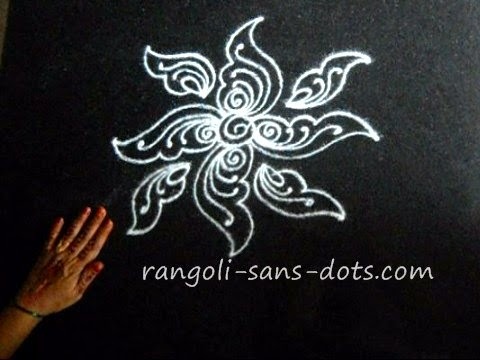 There are quite a few deepam or vilakku kolam designs in Rangoli-sans-dots. Some of them and some new ones form the subject of this post. 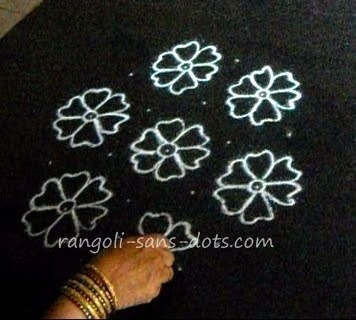 These kolam will be with dot grids. Diya rangoli many of them drawn free hand are also there in Rangoli-sans-dots. 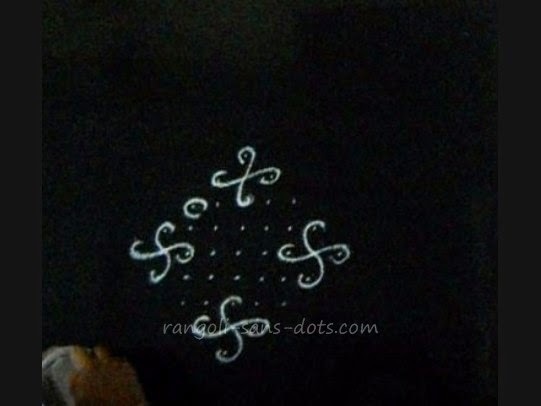 This kolam is with dots - pattern is 9 dots to 1 dot (in between - idukku pulli in Tamil). 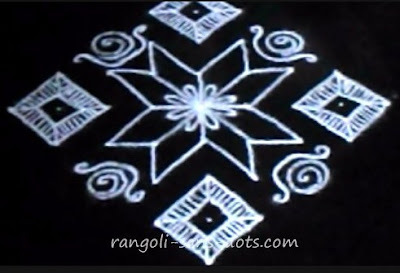 This is a common lamps kolam design also called a vilakku kolam in Tamil. 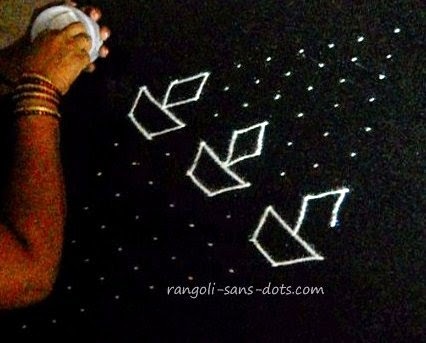 Place the dot grid, draw the lamps or vilakku patterns - three at the centre, two on either side and finally one at the top. 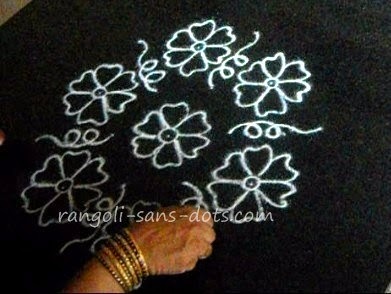 The dot that are remaining are used to draw small flower patters. Two images showing the intermediate steps. 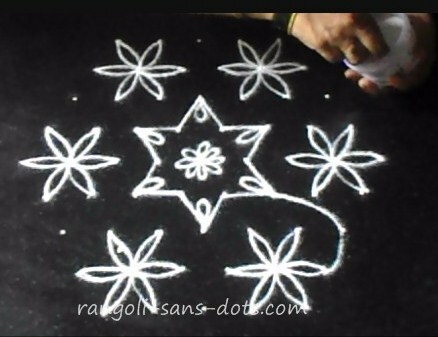 Neli kolam or sikku kolam are drawn frequently for daily kolam designs. The simplest of them with 3 , 4 or 5 dots can be drawn where space is a constraint. Above- one such simple design with a 4 by 4 dot pattern with two images showing how the line curves in and out to get the final beautiful symmetrical design. 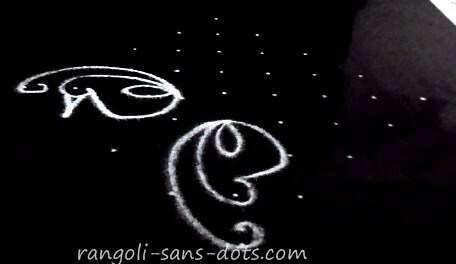 Birds, birds... there are already many bird kolam / muggu designs under this heading but I cannot stop , so one more bird muggu with 9 dots created using the dot pattern 9 to 5 idukku pulli. 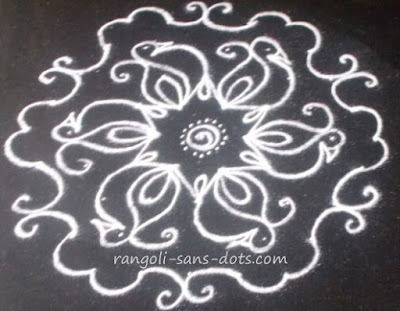 This is a suitable design if you are looking for medium sized Sankranthi muggulu designs or Pongal kolam with 9 dots. 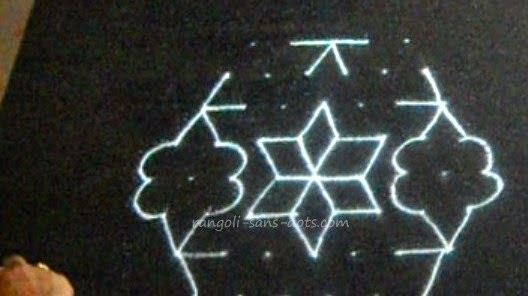 The next kolam is also quite simple though the dot grid used in 9 to 1 ner pulli. 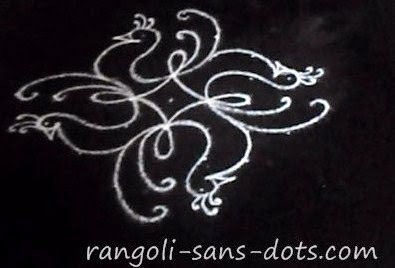 For a nine pulli kolam it is quite simple and can be drawn if we want to learn, because the patterns used are basic and easy. 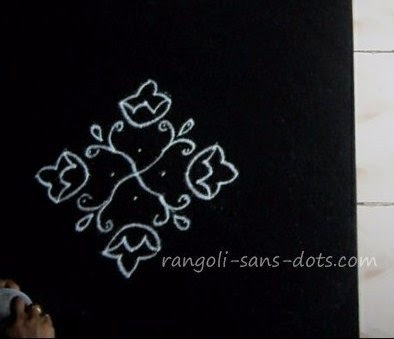 The two steps in the photos below along with the completed kolam. 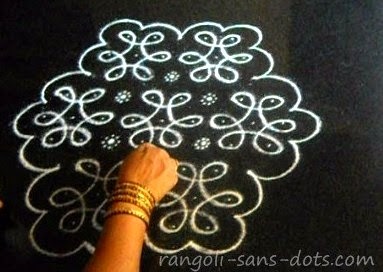 Kolam with dots are in demand for Deepavali season. The kolam below has been left and the white kolam stage and we can fill it with colours of our choice. 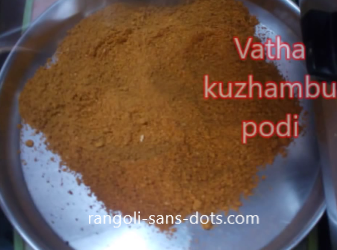 The dot pattern in 9 to 5 idukku pulli. After placing the dot grid draw the six floral patterns. 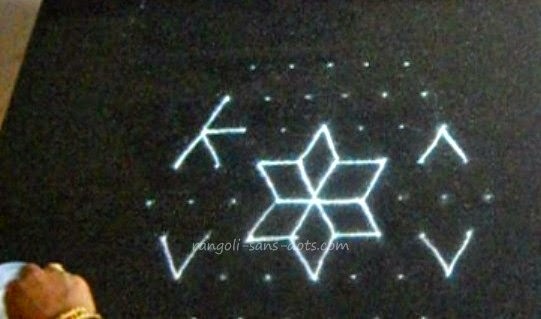 The dots at the centre are used to form a star design ( I have used this design many times in Rangolisansdots ). 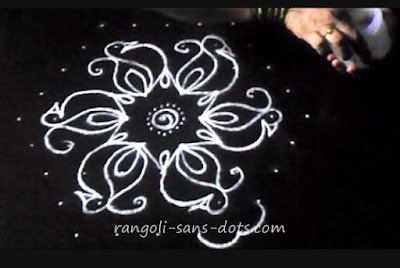 Use up the remaining dots to connect the flowers to the central design. 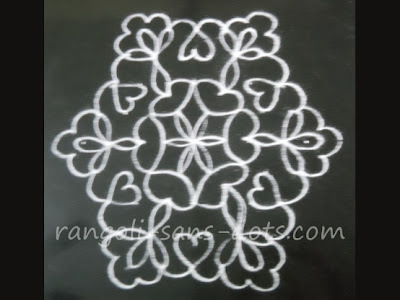 Add some free hand patterns to complete the kolam. Bright colours to celebrate the festival of lights. 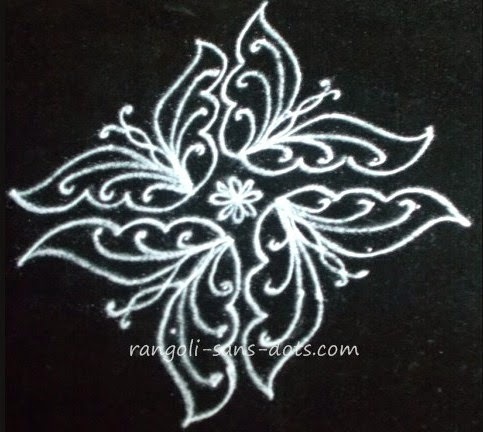 The images below give the steps for this kolam. Another simple kolam with 9 to 5 dot pattern. I have left it at the plain stage. 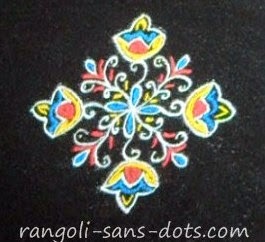 An excellent kolam for adding colours. Please try. It has simple floral patterns all around . 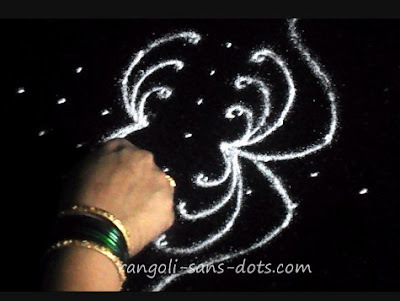 Can be drawn as a part of daily kolangal.